Would anyone give matches to a child to play with? It seems that playing with an Ouija board would be like giving children matches to play with because giving matches to children will give them the potential to cause damage to themselves and others and damage to the environment. As far as the Ouija is concerned there is obvious danger when dealing with things that is not fully understood. Yet, people play games with it. 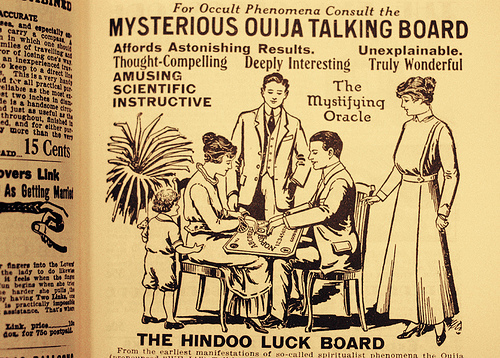 One of the controversy ways of contacting the unknown is through the use of an Ouija. Some people will go on record and give testimony that in their experience nothing good is accomplished if you play with an Ouija. Others may say that in their experience with the Ouija has been neither positive or negative. Still, very few people have reported having a truly positive experience with the Ouija. What is certain is that there will be some type of result. The result may be one that you may not be ready to deal with. Just what is an Ouija? The word itself is a combination of the French word “oui” which in English is translated as “yes” and the German word “ja” which in English is also translated as “yes.” In essence in English the word is for Ouija is “Yes-Yes.” The Ouija itself is a wooden tripod on rollers (a Planchette) which moves over a smooth board that has the letters of the alphabet, numbers from zero to nine, hello & good buy and yes-no written on it. The tripod acts as a pointer that point to a letter spelling out a message. The Ouija has ancient origins; no one person or culture can be credited as being the creators. Throughout the ages the Ouija has been reinvented and rediscovered in a variety of locations. It has been documented that in Greece in 540 BC the philosopher Pythagoras was a member of a sect that frequently held séances or circles where a version of the Ouija was used. Pythagoras and his student Philolaus interpreted the messages to audiences as being revelations of the unseen world. In China around 551 to 479 BC, the use of the Ouija was common. It was considered to be a non-threaten way of communicating with the dead. In Rome the usage of a version of the Ouija became popular around the third century. There was a famous case where three people used a version of the Ouija to predict the Emperor’s successor. The prediction was correct, since the knowledge was not public. The three people were arrested and put on trial for treason, while the person who was named to succeed the Emperor was executed. In Mongolia around the thirteenth century the use of the Ouija was done for the purpose of divination and instruction. In America before the arrival of Columbus the Native Americans used instruments that they called “squdilatc boards” to locate missing items and lost people. The board was also consulted as to when and how some religious ceremonies should be performed. The board was similar to the one used today, except it had symbols written on it instead of the alphabet. During the modern era the Ouija was patented in the U.S in 1893. The patent was issued to Elijah Bond who was the person that was credited with inventing the Ouija. The following year it was re-patented by William Fuld after he brought the rights to the Ouija from Elijah Bond. Flud established a factory and mass produced the Ouija and distributed it through his company the Baltimore talking Board Company. Flud claimed that he built the factory on the ouija’s advice. He also stated that since the business of mass producing and distributing the Ouija was going so well, he had not consulted the Ouija since. In 1966 Parker Brothers the producer of many popular board games, purchased the rights to the Ouija. Parker Brothers sold more than two million Ouija boards which surpassed the sales of Monopoly their best-selling game within the first full year of production after purchasing the rights. There are two major theories that attempts to explain how an Ouija board works. The first theory is a scientific theory called “automatism.” This theory contends that the messages come from within. The word “automatism” itself means the moving or function of a part of the body without conscious control. An example would be the heartbeat, or the eye-lid movements. Psychologically it means that the subconscious controls a person’s actions without the person’s intention or awareness when it comes to the psychic phenomena. In essence this means that the messages that are produced are a product of the Ouija board’s user’s subconscious mind. In as much as this theory is accepted. There has been very little research that proved it. The second theory is the spiritualist theory. This theory is an old one. The theory maintains that the Ouija is used by the spirits of dead souls to communicate with the living. Occasionally the spirits seek intent to interact with the living. There are various theories why spirits seek to interact with the living, their potential for good and evil and the messages that they deliver. The general belief about the Ouija board is that it is the doorway to the spirit realm, the supernatural, and the paranormal. It has been documented that infestation of malevolent spirits in a person’s life or home was because that person or someone living in their home dabbled with an Ouija board. Likewise, there have been many cases of the perpetrators of deviant actions that resulted in the death or mutilation of another was done on advice that was received through the use of an Ouija board. The vast majority of spiritualists, psychics, paranormal investigators, demonologists, and many belief systems agree that spirits that communicate via the Ouija board are the spirits of non-humans masquerading as a human spirit. If the spirit of a deceased human communicates through the Ouija it is more than likely to be that of an extremely confused spirit who has not moved on and is lingering on the earth for some reason. More than likely these types of spirits thrive on negative emotions and energy and are often corrupted, vengeful and murderous. I totally agree that Ouija is not a play toy but i do not agree that if you know about it that it cannot be a positive thing. I have had a board for ages. I do not use it to contact the world beyond because I have a sixth sense and have been sensitive to the world beyond as has all of my family and have been in touch and feel a closeness with it. My Ouija give my room a wonderful aura and it just lets me know at the end of each day that things in my world are all alright. That is my contact and experience with it and it comforts me. Nice that you have a positive experience with the Ouija; each person’s experience with it is unique. But I still would not mess around with it as you know you spirits can be deceptive…..